Stormwater runoff is the #1 pollution threat to our lakes! Runoff happens when we build roads, houses, lawns and driveways. These impermeable surfaces do not absorb rain. Stormwater runoff picks up pollutants such as soil, fertilizers, pesticides, manure, and petroleum products. 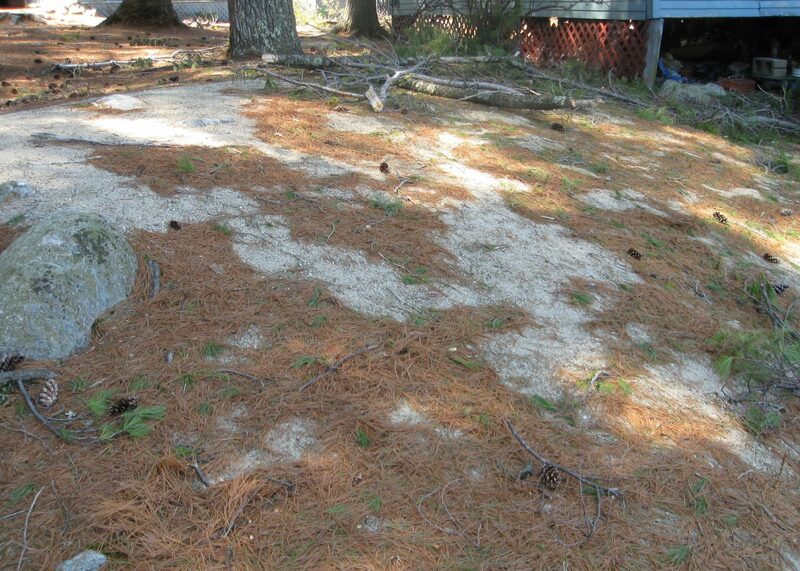 Even common soil is a pollutant. It contains phosphorus that acts as plant food, causing aquatic plants to grow excessively. Runoff can also contain harmful bacteria, viruses and toxic materials from the land. Recreational opportunities including fishing, swimming, boating; and significant revenue from tourism and property taxes. Residents in both Acton, ME and Wakefield, NH indicate that they value the rural beauty and way of life enhanced by the region’s many lakes and ponds. 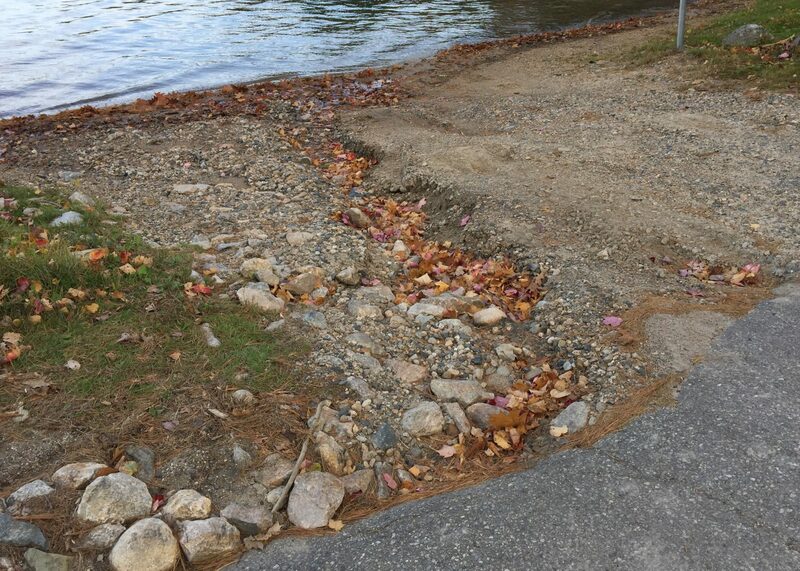 The NH Department of Environmental Services and the ME Department of Environmental Protection cite erosion as the number one threat to the water quality of our lakes and ponds. Stormwater can carry pollutants including sediments, nutrients (fertilizers, failing septic systems, pet waste), salt, pathogens and toxic contaminants into our waters. An ounce of prevention is worth a pound of cure! AWWA’s efforts are focused on keeping the treasured waters of the region as healthy as possible. When water is channelized it creates a gulley where soil is eroded into the lake. This is an example of sheet erosion, occurring when there is no vegetation or water diverter to slow the flow of stormwater. Lower Property Values: Property values may decline when a lake, pond or stream fills with sediment. Shallow areas encourage weed growth and create boating hazards. A decline in water clarity can result in a direct impact on property values. A study conducted by the University of Maine, and the Maine Department of Environmental Protection, found that a 3 foot decrease in transparency caused property values to decrease in the range of 3.1% to 8.5%. If you factor in all the properties along our lakes, that is millions of dollars in lost value. Without the “subsidies” provided by waterfront property taxes, local taxes would increase substantially. Thus, the AWWA lakes are the region’s economic engine. Poor Fishing: Muddy water drives away fish who rely on their eyesight to see food, it covers gravel beds where fish spawn, smothers microscopic organisms that the fish eat and it may damage fish gills. Nuisance Growth of Weeds and Algae: Sediment carries nutrients that feed algae and aquatic weeds, and potentially provide a surface for invasive species to grow. Cyanobacteria: The same nutrients that feed algae also feed cyanobacteria. These bacteria are present in all lakes. 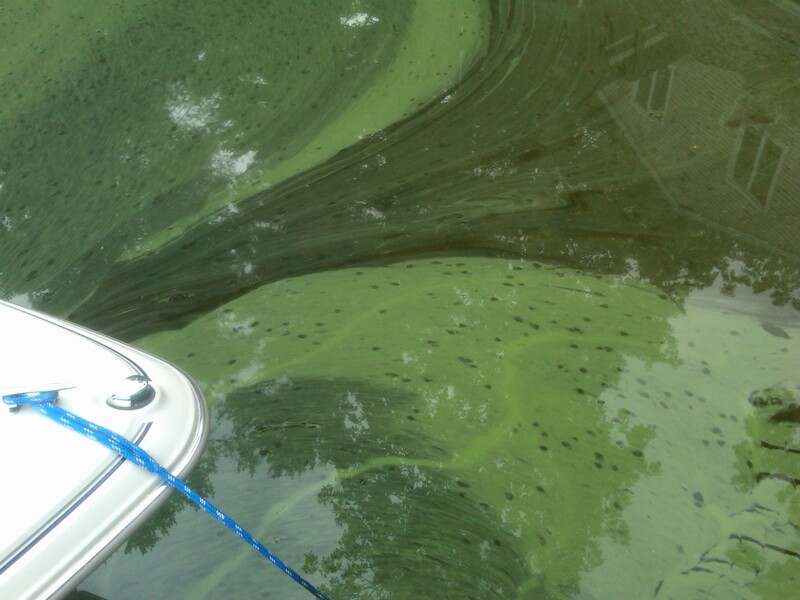 Under the right conditions cyanobacteria can spread quickly, forming dense “blooms” on a water body’s surface. These blooms can cause serious problems because many cyanobacteria species produce toxins that are dangerous to humans and wildlife. Cyanobacteria and their toxins can be found in water as well as in the air nearby. For more information please visit the EPA’s websites about cyanobacteria. Loss of Tourism: Muddy lakes or ponds, with higher weed coverage, are not attractive to fishermen, boaters, swimmers and tourists. This can impact all businesses as well as land values in a region. Local Tax Impacts: Cleaning up sediment in streets, sewers and ditches, or removing invasive species or weeds can be very expensive to local towns. When cyanobacteria blooms it looks like blue-green paint mixed in with the water. If you see this stay out of the water and report it to the Town Health Officer and the NHDES Beaches program (603) 271-0698 in NH or just the Town Health Officer in Maine. 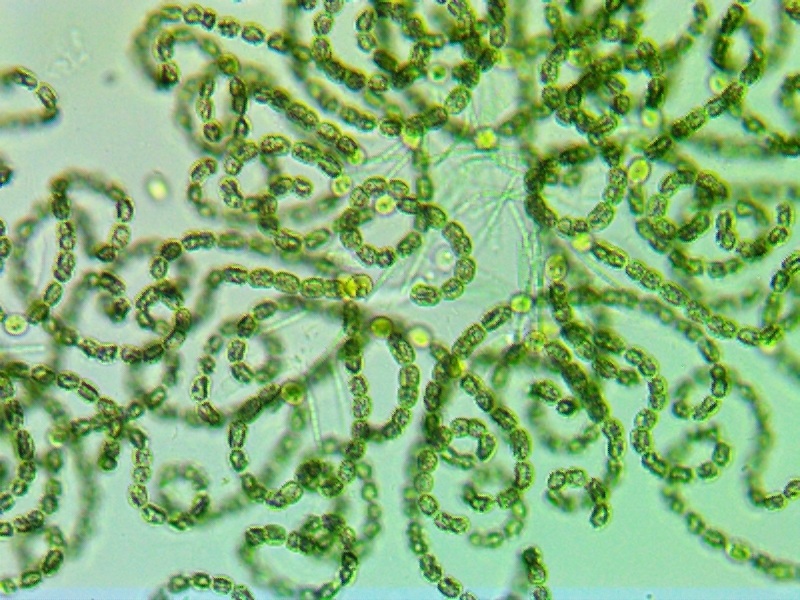 A microscopic view of the cyanobacteria Anabaena.